Did the model — designed and built by Joe Kazlauskas in 1977, eight years after the Calder’s dedication so a design for lighting the stabile where it’s installed could be implemented — try to make a break for it? 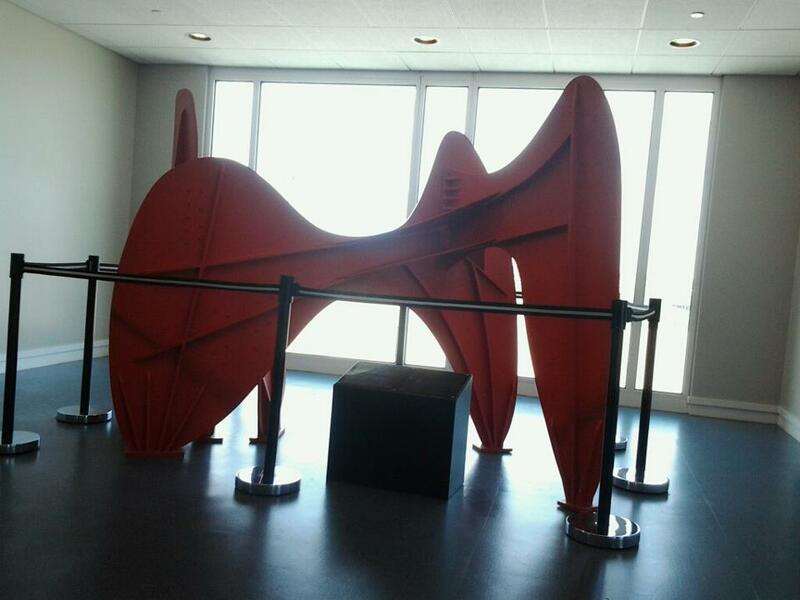 There’s a point at which measures taken to protect an artwork are just as destructive artistically as whatever vandalism they’re presumably trying to prevent in a part of the airport in which the passengers have already moved through security. I uploaded this photo to my Facebook page after recently visiting Grand Rapids for the first time, and I’m gratified to say that bad public art displays in Western Michigan are more controversial in Houston than hiring a married gay whore to take charge of visual arts coverage at an arts magazine. The folks at the Grand Rapids airport should be less thrilled. Downtown, the Calder really is an amazing landmark; the Urban Institute for Contemporary Arts is open until 9 p.m. most nights; and the Grand Rapids Art Museum, which is run by former Austin Museum of Art director Dana Friis-Hansen, has a terrific trio of Robert Rauschenberg exhibitions that Houston art lovers would covet. Rauschenberg at Gemini,which showcases work he did over the years with the legendary prints-and-multiples publisher, is a revelation, especially for the stunning — and, of course, stunningly varied — sculptural editions. Synapsis Shuffle, in which a group of volunteers got to arrange 52 Rauschenberg panels to their liking under certain rules, is great fun and is being exhibited only for the third time (the first two were in New York and Paris). Rauschenberg in Context has to make do with mostly minor works by him and his immediate predecessors and colleagues but is an admirable effort to ground visitors in his milieu and something I wish Houston museums would do more often. Watching the TV news clip above, it was sweet seeing that the anchors seemed as giddy about their hometown museum showcasing a challenging 20th- and 21st century artist as they would about a King Tut show. Clearly Grand Rapids is an art town, even if the airport hasn’t gotten the memo. ← Best. Job. Interview. Ever.